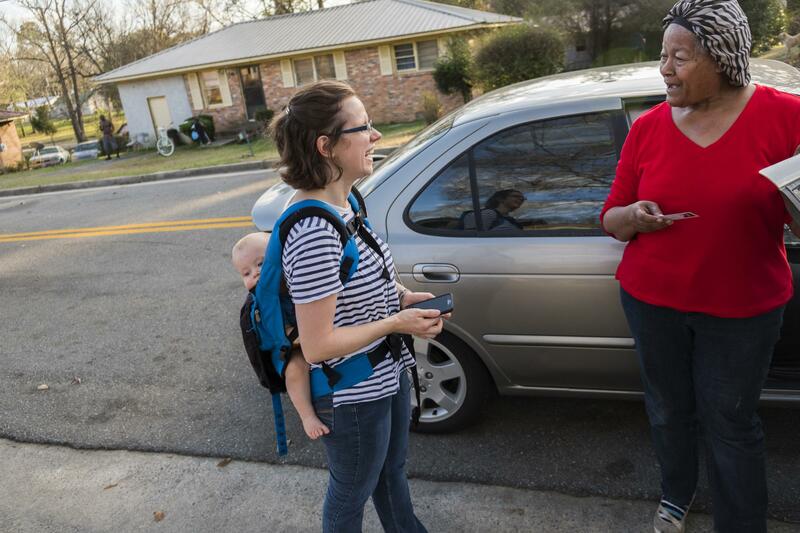 Cheyenne Warnock, left, carrying one of her four children, talks with Shirley Home during Warnock's first day of door to door canvassing in Cochran in her run for a Georgia legislative seat. 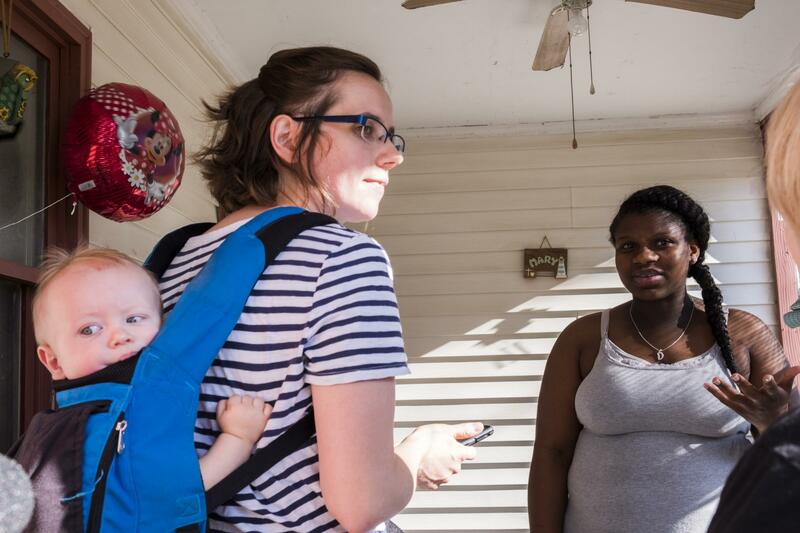 Cheyenne Warnock, left, candidate for a Georgia House of Representatives seat talks with Deandrea Baker on the porch of her Cochran home during Warnock's first day of door to door canvassing. Cheyenne Warnock knocks on doors in her hometown of Cochran south of Macon. She’s campaigning with her 9 month old baby in a carrier on her back. Her three other kids are at home with a sitter. Friday, March 9 is the final day of qualifying in Georgia for the 2018 elections. Many of the candidates are women stepping into the political arena for the first time. 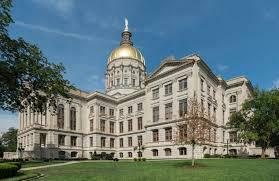 Ten are running for Congressional seats, many others for state and local offices. Cheyenne Warnock is running for House District 144 that includes all or parts of Bibb, Bleckley, Houston, Jones, Laurens, Twiggs and Wilkinson Counties. She said her oldest son convinced her to run for a seat in the Georgia House. “He’s really probably the biggest reason that I’m running for office because I want him to see that people can make a difference and get involved and there’s always something that all of us can do even if it’s not running for offices,” she said. But she thinks running for office is the best way to look out for rural parts of the state and issues like health care, economic development and education. Warnock said responses from family and friends on her decision have been varied. “Some people have been really excited. A lot of people have asked me, ‘Who will watch the kids?’ if I get elected,” she said. 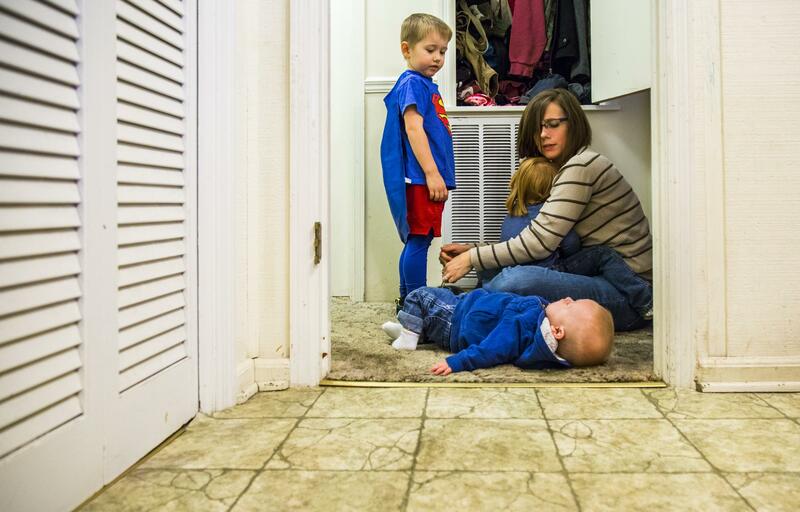 Cheyenne Warnock works to get her children ready to play in the backyard of their Cochran home recently. Statistically just over 20 percent of those holding elected office are women, but those numbers are expected to rise. According to Rutgers University, the number of women running for Congress this year has nearly doubled from 2016, to more than 400. But several women have chosen to stay behind the scenes in more of an advocacy role. Claire Cox founded a non-partisan group in Middle Georgia called Georgia Women and Those Who Stand with Us. The group focuses on issues affecting women and families. It helped Warner Robins become the first Georgia city to offer paid family leave. Cox said the group came together following the Women’s March on Washington last year. Back in Cochran, Cheyenne Warnock kept knocking on doors. She left a campaign card with Deandrea Baker who agreed to help out as a volunteer. “The election’s not until November. We’re getting a head start here,” Warnock said. The seat Warnock is running for is currently held by Republican Bubber Epps who recently announced he will not seek re-election. Warnock’s other opponents include Democrats Jessica Walden and Mary Anne Whipple Lue and Republicans Danny Mathis and Milton Sampson.